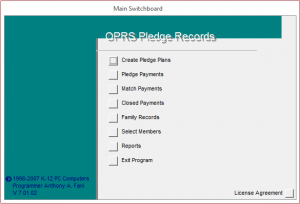 OPRS Pledge Records allows the parish to manage pledges to a capital campaign. Parishes can accept pledges to be paid over multiple years, produce payment coupons, record payments, manage matching pledges send statements for taxes and thank you letters. Pledge records have many reports to help the administration follow the campaign progress.